well, well, well what more do you expect from the only pub left in chelsea. well i certanily dont expect a drug and drunk filled hole, with terrable bar staff and a death threat. not worth the agro of this incounter, a definate place to avoid. a rud down dive in a up and comeing area. management was like an extra from the adams family movie, bar staff were like clones of him. and more drug dealers youy could shake a stick at. should be closed down, an eye saw to the good pubs of chelsea, definatly letting the area down. Just noticed a remarkable coincidence - if you look at lukinner's profile, you will see he has posted favourable reviews for three pubs- and they all happen to belong to Ascot Inns! Sorry, Mr.Healy, if you're going to praise your own pubs, you'll have to cover up your tracks better than this! Thanks to all @ Riley's for a great St Pat's day party. We'll be back!! Been using this pub on and off for a few years now. It's exactly as the last comment posted, a good old fashioned boozer. The furnishings may not be the most expensive and comfortable on the Kings Road, but then neither are the prices!! What is does have is great staff, friendly customers and good veiwing options for sports. The toilets are clean, the larger is good and the prices are right. That'll do for me. Yipee, a proper pub. Customers nearly all local and very very friendly. Cheap prices only for locals with loyalty cards and only midweek. Toilets clean, staff brill. If you want Chelsea posh and lots of style Rileys is the last place you should go to. 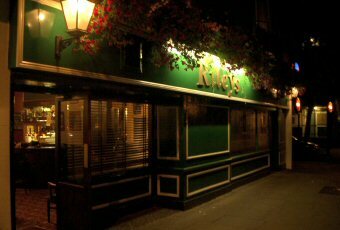 However if you just want a drink in a good old fashioned environment then it's Rileys all day long.